The 1998 Building Service Contractors Association International Carpet Guide says “The pile brush type vacuum will remove deeply embedded soil, and open up a nap more than a regular, lightweight vacuum. Usually, a pile brush machine will be used weekly on traffic lanes, monthly on all of the carpeted areas, and always just before any cleaning process. The pile brush vacuum is a dual-purpose machine because it is used both to maintain commercial carpet and to clean”. The Certified® Dirt-O-Meter is a demonstration tool used to show what is missed by tradtional vacuuming and even deep extraction. As you can see, the once clean/white filter is completely saturated with dirt after only a few passes in a high traffic lane. 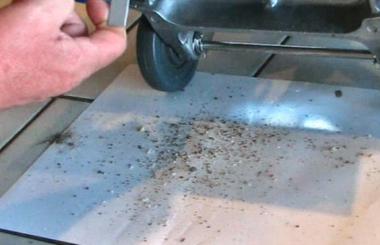 The Pile Brush removes heavy sand, dirt, rocks, and abrasive soil that fall to the base of carpet that regular vacuums cannot remove. By removing damaging soil, the Certified Pile Brush can drastically increase the life of commercial carpet. Help remove traffic pattern lanes by restoring and unifying their appearance with the surrounding carpet. Restore breathability back into the carpet by gently grooming the nap. Add life to your commercial or residential carpet by restoring and maintaining the original appearance of the carpet pile. Improve indoor air quality throughout a facility by removing particles in the carpet that could become airborne. Enhance the performance of cleaning chemicals by removing the deeply embedded soil that inhibits those chemicals from reaching the carpet fibers. Save money by postponing the replacement of your commercial or residential carpet. 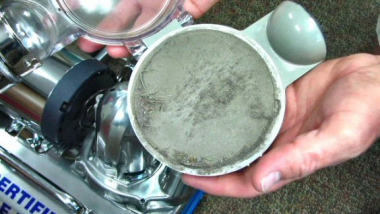 Reduce labor/chemical costs by reducing the frequency of deep cleaning wet extraction.